The Big Business of Spam: Dr. Oz’s Brand New Trick to Shed 27 Pounds in Just One Month!! You are here: Home / Network and Application Security / The Big Business of Spam: Dr. Oz’s Brand New Trick to Shed 27 Pounds in Just One Month!! With a high obesity rate in the United States, people are looking for hope to find a miracle cure for weight loss. Unfortunately, spammers understand this and why it’s no surprise that Barracuda Central has picked up about 6,000 diet spam type emails since the beginning of 2015. With the Memorial Day holiday just passing, signaling bikini season, it’s also no surprise we have seen a rise in the volume of diet spam – showing just how intelligent spammers’ planning around the timing of certain types of spam are creating the big business of spam. One name that is often seen in the media in relation to cures for weight loss is Dr. Oz, who is no stranger to being scrutinized. 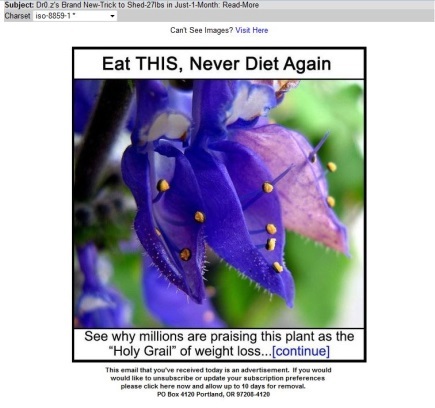 Spammers often take advantage of his namesake and people’s hope for a weight loss miracle cure. In this specific email (figure 1), when a user opens a link, they will be directed to a news webpage that describes Dr. Oz’s weight loss discovery. This type of spam often displays names and pictures of well-known people, to try to entice the reader even more – Rachel Ray is used in the example below (figure 2). 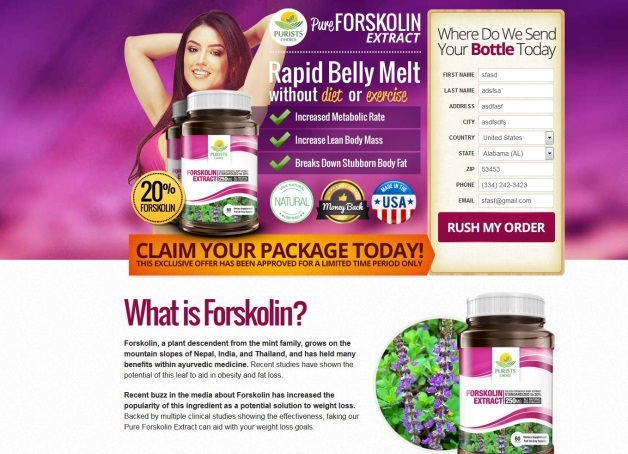 The site claims that “Pure Forskolin Extract,” (see Ad in Figure 3) which was actually introduced on the Dr. Oz show, is a “miracle pill” weight loss solution. It claims to burn body fat, and leaves the person with only lean muscle. Although the website is fake, part of the website’s content make it look legitimate to users. The first thing that the user will notice is the video of Dr. Oz advertising the Forskolin supplement that causes belly fat to melt. The website also uses content from healthierlivingdecision.com to make it look legitimate and mask the true nature of the site. But if the user clicks on any of the links on the website, including the registration link, it will direct them to the product page where they are prompted to enter their personal information, including their credit card. Once the scammer has this information, they may charge the victim for products that they will never receive. To further convince people to buy the product, the website has reviews written by what appears to be users logged into Facebook. Recent research discovered that 51 percent of millennials say social opinions influence their purchase decisions. Read more on that here. Here they’ve adopted marketing and business tactics to maximize their ROI. Yet another example of how serious spammers are in attempting to run their scam like a business. As long as Dr. Oz is in the media and there is a want for a miracle weight loss pills, spammers will be taking advantage of his audience. CBS News, Dr. Oz Defend “Quack Treatments” On Air. It is important to always use best practices when sharing sensitive information like, home mailing address, first and last names and credit card information. If you are doing any type of online shopping we stress that you go directly to the site rather than clicking on unfamiliar emails, attachments or links. Users are protected against this type of email spam with Barracuda Spam Firewall and Barracuda Email Security Service. The Big Business of Spam Scammers Once Again Looking to Capitalize on a Tragic Natural Disaster. For more education on how to keep safe from these types of emails, please visit Barracuda Central. Are You Prepared for Cryptolocker? Users Need Constant Education on Email Security. Can This Actress Take Down Your Network?